An Englishman's home is his castle so why not commission a unique portrait for you or a loved one to celebrate a much loved home. 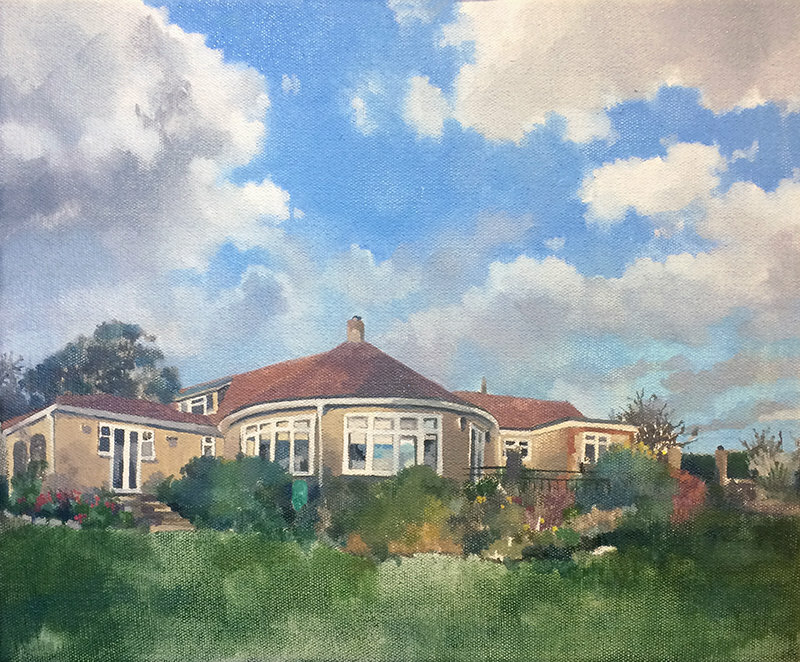 You may have just moved into your new special place or want a keepsake of the one you are leaving, or maybe a special gift for a special person... whatever your reason for commissioning a house portrait just email me some photographs of the property and I will make a painting for you. You can choose between a standard A5, A4 or A3 sized canvas on a stretcher frame or a painting on board. For a painting on board the price is £80 for an A5 sized painting, £100 for an A4 and £120 for an A3. For canvas, as I need to make a stretcher frame and prime the canvas with Gesso, then just add £20 to each size; so a painting on an A5 size will be £100, A4 for £120 and £140 for an A3 sized canvas. Postage & package for an A5 size is set at £3.50 and £5.50 for A4 and £6.50 for A3 sized paintings. Larger items will have to be charged on an individual basis. If you would prefer a custom size or a larger painting to suit a particular space, or to capture a particular view or differently shaped residence that's great too, just contact me and we can discuss your painting. To order your house portrait or for any other enquiries about purchasing or commissioning a painting please get in touch, I would love to hear from you.